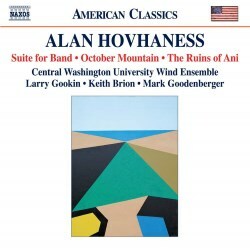 Naxos continue to raise a staunch voice for American-Armenian composer Alan Hovhaness. The Ariadne thread of this label's dedication can be traced back at least a decade and now confidently reappears with many recording premieres. Recurrent themes in the Hovhaness catalogue are explored on the present disc, including mountains and Armenia’s legends and history. The programme divides between works for windband (Tapor, Three Improvisations on Folk Tunes, Hymn to Yerevan and the Suite) and the rest in various permutations of smaller ensemble. Tapor, the earliest of the works here is very short and sets out a trope typical of this composer - a slow cortege of grandeur here surmounted by silvery trumpets. It has Rosner's dignity and the devotional air of a Rubbra lento. Mountain Under the Sea, from some four decades later, is equally brief. An alto saxophone (Jason Talbot) provides the melodic line which drifts close to Ravel's Boléro. The solo is hummed or hemmed around by chiming percussion. The three short Improvisations around Bansri, Bengali and Pakistani tunes feel as if they drew inspiration from the composer's bursary tour of the East with Henry Cowell in the 1950s. The first, with its beguilingly tripping effects touches on the same Muslim exoticism as Rodrigo in Aranjuez. The second, on the tune My Boat Is on Land sounds a little like Tapor in its slowly measured processional. It is relieved by the woodwind who add soloistic passages amid airy textures. The final Bengali lute tune appears through a tinkling complexity of bell sounds. A dance element feels as if it has been influenced by Copland. The piece ends with gruff brass. Vision on a Starry Night (1985) is a delicate skein for xylophone, harp and flute. The similarly titled Vision of a Starry Night is from the piano sonata Ananda (1977) once recorded by Marvin Rosen. October Mountain is, like so much else here, in micro-cellular movements which engage in a sinuous embrace with the East. Among a maze of tinkle and tingle a hint of kodo drums is added. The Hymn to Yerevan takes a dark tincture in the shape of a slow processional with slaloming groaning trombones recalling similar effects in the symphony Vishnu. The Meditation on Ardalus is pointedly balletic and lively rather than warm. This solo is comparable in tone with the same composer's Spirit of Ink; also for flute - three of them. The Ruins of Ani is a further engagement with the composer's vision of the ancient Armenian city of Ani. It dates from about the same period as the Ani Symphony (also reviewed here). The wind ensemble encompasses angry buzzing then coaxing yet pallid melancholy - a sense of gentle and healing floats clear. Predominantly introspective, The Burning House overture is memorable for softly 'stung' gongs resonating alongside Maggie Whiteman's very quiet flute. We end with the little six-movement Suite for Band: with three Arias interspersed among two Processionals and a Canzona. The six are played with minimal breaks. Each has a sense of wholesome kinship with its neighbour. The first Aria is more of a hymn than a song. It's certainly not at all Italianate, unlike the second which is redolent of Gabrieli. The third pays out its melodic line in curvaceous currency. The two Processionals are along the lines of the same composer's Avak the Healer and Rosner's Tudor-inflected works may come to mind. Keith Brion's notes for this disc valuably avoid re-ploughing obvious biographical territory. They get straight to the point with commentary on each of these ten works. Virgil Thomson's description of the music in 1947 is apt: "utterly simple in feeling, pure in Spirit and high-minded … thoroughly refreshing."